Canine urolithiasis is a condition in which crystals develop in the urine, often leading to the formation of bladder stones. Depending on the mineral makeup of the stones, a calculoytic diet is recommended by veterinarians to dissolve and/or prevent recurrence of certain types of crystals and bladder stones. Since urine pH is one of the factors in stone formation, changing your dog's diet can help to prevent crystals and stones from reoccurring. There are different types of urine crystals and the chemical makeup of them should be determined before beginning treatment. Calcium oxalate and struvite stones are the most common. Urinalysis will determine if your dog has an underlying bladder infection that is often the cause of urine crystals and whether or not antibiotic treatment will be needed in addition to dietary changes. Some dogs will need surgery to remove stones that block the flow of urine and the stone can then be analyzed. Mary Bowles, DVM, DACVIM at the Department of Veterinary Clinical Sciences at Oklahoma State University recommends a calculoytic diet for dogs with struvite crystals, as this type of diet reduces the amino acids, magnesium, calcium and phosphorus building blocks that form the bladder stones and will usually break up the crystals within six months. It can dissolve both sterile crystals and crystals caused by a bacterial infection. Hill's Prescription Diet Canine s/d® or u/d® is a veterinarian recommended calculoytic diet. Hill's Prescription Diet is available only through your veterinarian and comes in both canned and dry formulas: u/d® for dogs with urate, calcium oxalate and cystine urolithiasis and s/d® to help dissolve struvite crystals and stones. A calculoytic diet creates an acidic, dilute urine and should not be maintained for longer than six months. The increased sodium content, nutrient restrictions and fat content make it unsuitable for puppies, dogs with hypertension or pregnant or lactating dogs. Some stones cannot be controlled or dissolved with diet and must be surgically removed. In such cases, all that can be done is to try and create a urine with a pH that is unfavorable to stone growth. About 50% of dogs with urolithiasis will have recurring problems if their condition is not managed properly. 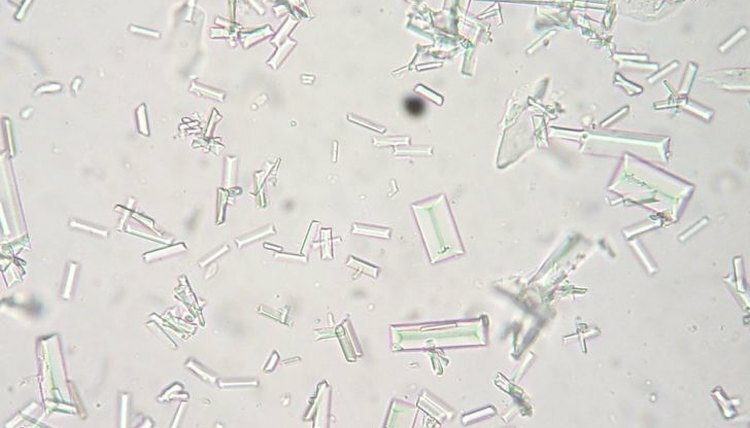 If your dog has had urine crystals, never feed them their food dry. Add a cup of water for each cup of dry food and allow the food to absorb the moisture completely before giving it to your dog. The objective is to double urine output and reduce urine specific gravity to < 1.020. Allow your dog frequent opportunities to empty his bladder. Food changes should be introduced gradually over a period of about a week unless otherwise recommended by your veterinarian. The success of treatment will depend on adherence to the diet outlined by your veterinarian and no other foods should be fed during this treatment period without your veterinarian's approval.